Yountville, California, located in the Napa Valley is such a quaint little town. Even at the peak of the tourist season, it was still fun to hang out and visit some stores and restaurants. The first place we discovered yesterday was Ma(i)sonry. 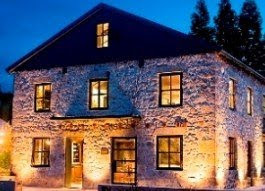 Built in 1904 as a private residence and lovingly restored, it is now a furniture, art and wine tasting gallery. Inside, the stone walls are just gorgeous. The objects d'art and antique furniture are all unique and beautifully arranged. I could seriously live here! I kept imagining what it would be like to live in a stone house and how I would decorate it. I'm enamored with stone walls as it is, so this was like nirvana for me! I was admiring this art deco glass coffee table. Notice the two paintings on the wall. I would gladly take home these vintage leather suitcases, but they were a little too expensive. Can't you just imagine them stacked next to a bed or sofa? There is a lovely courtyard for wine tasting, private parties or just for relaxing. I love this little outdoor vignette of rusty, crusty objects d'art - all for sale. 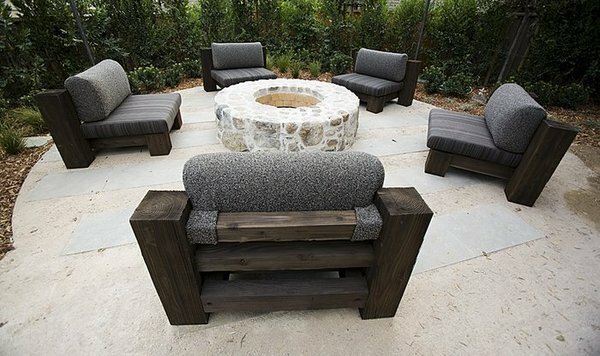 The fire pit was made from left over stone, original to the house when they restored it. 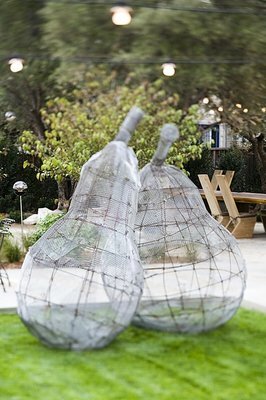 A fun garden sculpture of pears! 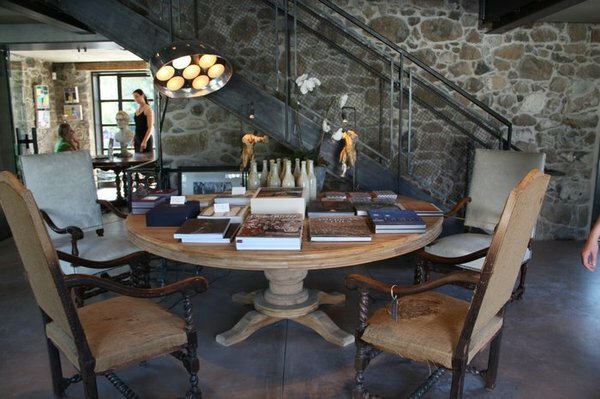 If you have a chance to visit Yountville in Napa Valley, do stop in at Ma(i)sonry for a glass of wine and some eye candy. In the meantime, visit their website here for more history and information about Ma(i)sonry. As a side note, One Kings Lane is featuring Ma(i)sonry today. The owner and founder, Michael Polenske is offering some items for sale. Hey, those suitcases are marked down to $7499 for the three! Hmmm, still too much for my budget! As you well know by now, stone walls are my favorite! So I'm joining Laurie for Favorite Things Saturday at Bargain Hunting With Laurie. To view another post I wrote on stone walls, click here. The kind of place I would love to visit. Delores, what a beautiful place. I would love to see it in person. I love stone walls,too. I love Napa Valley. What a gorgeous place. I went to a beautiful wedding at a winery in Napa and it was one of the most beautiful settings for a wedding that I'd ever seen. Thanks for sharing these lovely photos. What a beautiful place. I loved everything and enjoyed your tour and the coments. I will have to come there someday. I think I will have to pass on the suitcases too, maybe next time at that price! The outdoor spaces were just delightful too. We have been to the Napa Valley area twice and can't wait to go back again! Two of our most relaxing trips by far...the wine didn't hurt either! I just saw the photo of your laundry room and love it! I have been wanting to do something more unique to our mudroom and I think that wallpaper might just be the thing. Thanks for the inspiration! Ma(i)sonry is a beautiful place. Interesting...but I like your home much better! Beautiful photos! What a great place to visit! Love it all! *** From one "rock/stone" lover to another, YES!! !~~~I could seriousy live here, too!FABULOUS!!! I always enjoy your postings, so THANKS! Thanks so much for sharing your water woes with me today...it's always encouraging to know we're not alone but I hate the thought that others have had to go through this too! I was drooling over Maisonry's items this morning on OKL...but the prices were a bit out of our range as well, lovely stuff though!!! How fun it would be to visit the shop. This is super great! My son's name is 'Mason' from his great-grandmother 'Anna Mason!' I would love a copy of that sign...so cool! I live on the East Coast, but your side looks so lovely :)!!! We live in a stacked stone house and are very fond of stone, too! Come see the ginger bread house that my son and I made for Christmas '09. I am posting Christmas ideas every now and then! We made the 'stone' from sugar covered pecans! You might like it, since you love stone! http://threepixielane.blogspot.com/2010/07/cabin-in-woodschristmas-ideas.html. Come visit my 'porch' post, as well! It offers a little view of some of our stone house! Thanks for sharing this beautiful Stone Gem with us! Happy Birthday to your lovely daughter! Take care! Stone walls, old leather chairs, aged wood and beautiful accessories, sounds like heaven to me. I had an idea after reading your comment this morning... what do you think of meeting up for lunch at my house with Kathysue and Lisa! I would love to have you over and meet you in person and if you want you can shop privately at my "Prop Shop"... that way you won't have to wait a month for the next Alameda Point Fair! I've heard Candlestick is not quite up to speed yet. Things are still a little unorganized and COLD! Anyway let me know what you think? Ahhhh - heaven. It's glorious! Yes, I would say that 7,000 for a decorative stack of suitcases might a bit out of my budget, too! LOL! Thank you for stopping by and commenting on the post, and the music! You're welcome to come shopping in our closets anytime! :) And as for inspiration - I'm jumping up and down over here. You have always inspired me - so I'm like a kid in a candy shop over your comment! Thanks for making my day! Such a great place! I truly love both of the paintings on the walls. btw, I highlighted your blog on my own blog this week. Check it out!